Dame Edith Louisa Sitwell DBE (7 September 1887 – 9 December 1964) was a British poet and critic and the eldest of the three literary Sitwells. Like her brothers Osbert and Sacheverell, Edith reacted badly to her eccentric, unloving parents, and lived for much of her life with her governess. She never married, but became passionately attached to the gay Russian painter Pavel Tchelitchew, and her home was always open to London's poetic circle, to whom she was unfailingly generous and helpful. 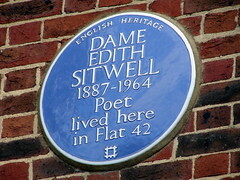 Sitwell published poetry continuously from 1913, some of it abstract and set to music. With her dramatic style and exotic costumes, she was sometimes labelled a poseur, but her work was praised for its solid technique and painstaking craftsmanship.